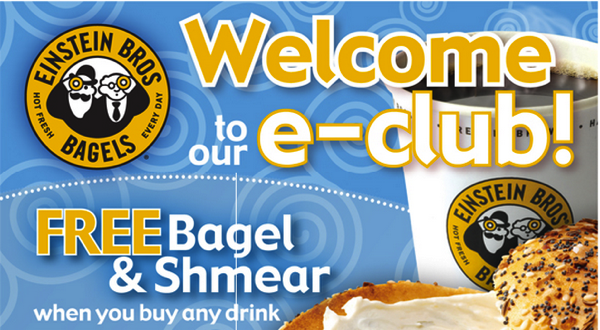 Signed up for Einstein Bro Bagel’s emailer and got free coupons! It’s one of my favorite restaurants that I consider a special treat since there are a whole bunch in Phoenix, but there was none near me in California. When I found out there was one at the hospital where I would be doing my internship I was EXSTATIC! Normally I am a pretty big advocate on meal planning, and if I had started this blog last quarter that would have been very apparent. Meal planning helps save your perishables from going to waste, therefore saving money, saves time over the hectic week, and keeps you on track. However, right now with free lunch at the EMC, not knowing when I’ll be jetting back to PHX, and other variables it has become a little difficult. I still try and think about it though and write it down, even if I don’t exactly end up sticking to it. This week I’ll be out of town Thursday-Sunday, so I know I don’t need to go to the grocery store. Instead, I need to try and utilize anything that would go bad if I didn’t eat it. 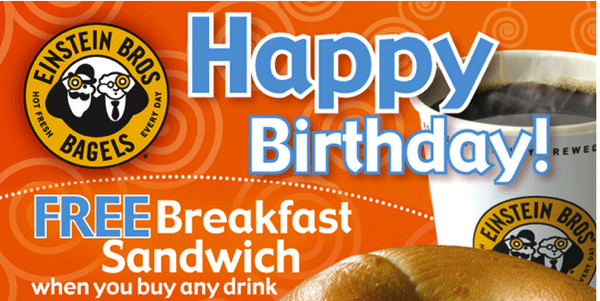 I also “need” to use my free Einstein’s Bagels Brothers coupons that will expire on 7/6 🙂 I got two free coupons, one for my birthday and one for joining their mailing list! SCORE! I mentioned before that getting free lunch every single day was at first overwhelming. There were so many choices and I couldn’t quite find the balance of what would be healthy but also have some staying power to get me through the next four hours. (I’m use to eating small meals and snacking a lot!) 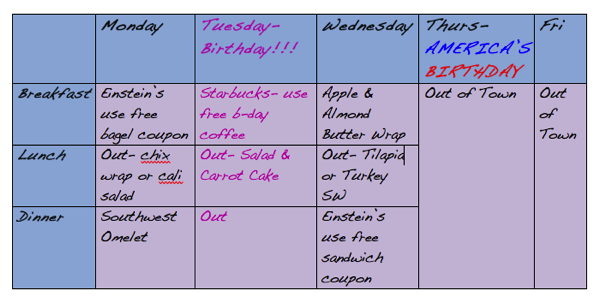 To help with this I look up the the cafe menu for the week (on Monday morning when it is available) to get an idea of what my options are. That way I can plan a couple of healthier options to chose from without being overwhelmed, especially since we only have 30 minutes to eat. Eat 15-20 grams protein per meal to support muscle strengthening. Use up spinach and TJ’s guilt free guacamole in the fridge before I leave. Use my free Einstein’s coupons before they expire! Do you take the time to plan your meals? What are your weekly meal planning goals? What are some of your favorite restaurants that bring back happy memories? I really like reading an article that can make men and women think. Also, many thanks for allowing for me to comment! Hi there, I do think your blog might be having web browser compatibility issues. When I look at your website in Safari, it looks fine however, when opening in Internet Explorer, it’s got some overlapping issues. I simply wanted to give you a quick heads up! Besides that, excellent blog!